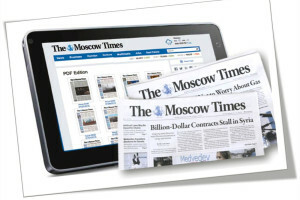 The Moscow Times and a minority stake in its sister publication Vedomosti are being sold to Demyan Kudryavtsev, former chief executive of major Russian publishing house Kommersant, news agency RBC reported citing an unidentified source. The head of Sanoma’s Russian operations declined to comment on Wednesday. Kudryavtsev declined RBC’s request for comment, and Sanoma did not respond to the agency’s request by press time. Sanoma, a Finnish media conglomerate, has been seeking buyers for its Russian assets since 2013. It is the sole owner of The Moscow Times and co-owner of Vedomosti, which is owned equally by Sanoma, FT Group and Dow Jones, publisher of The Wall Street Journal. Both Vedomosti and the Moscow Times are affected by legislation passed last year that bans foreign companies from owning more than 20 percent in Russian media companies after February 2017. A former journalist, Kudryavtsev was appointed CEO of the Kommersant publishing house in 2006 by the company’s then-owner, oligarch Boris Berezovsky, who died in Britain in 2013. Kudryavtsev left Kommersant in 2012. Kudryavtsev is currently acting without partners, according to RBC’s source. However, Vedomosti reported last month that Sanoma was looking to sell its stake in Vedomosti to a company representing the interests of Kudryavtsev, American businessman Martin Pompadur, the former head of News Corp. for Eastern and Central Europe, and Vladimir Voronov, the former president of News Corp. subsidiary News Media. Vedomosti reported at that time that Kudryavtsev and his partners were prepared to pay 6 million euros ($6.4 million) for a third of the newspaper. The Moscow Times was not mentioned in that report.